z u l f a d l i: Curses! 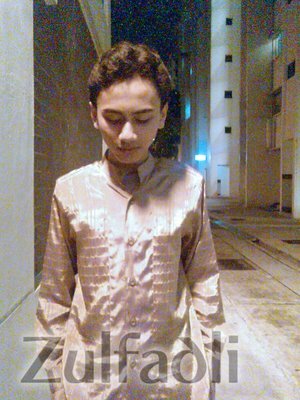 I'm still in my Hari Raya mood. There's no haze and thank God for bringing down rain today! Today I went outing again. Yesterday was fun because I got a few shots and money! Get paid for visiting? Heh! Anyway, today was fun because my cousins came to my house. I think I'm starting a new habit: stop vulgarities. Haaha! It has been one month I've not been using vulgarities but it's good to stop it anyway. Today is Wednesday, and today is the Fun, Fit and Fabulous day. And bravo me, I didn't even wake up in the morning. I think I was too tired by the outing last night. I slept around 2am? I set the alarm clock at 7.30am so that I could get ready for the fair. However, I'm still deep in my sleep and I don't even remember my phone or alarm clock ringing. I only remember my mother came into my room at 12.30pm waking me up. 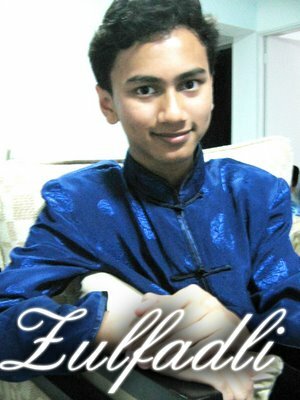 "Fadli! Wake up! Your uncle is coming later at 1.30pm..." Then I was like "Oh my god! I missed school!" A few more days before the examination. Oh yes, I received a message and a call saying that I got Higher Malay lesson today and thank you people for informing me thirty minutes before the class really started. I didn't go. If they would have told me earlier, I would have told my parents that I'm going for the class or something. And thanks to that someone for reminding me that on Thursday, there's lesson and it is the last lesson! It was suppose to be a "must-go" lesson. That reminder does not only remind me that there's Higher Malay lesson but it also reminds me that the school is yet to close! I thought it's holiday already! I learnt what I am losing. I learnt what I've not gained. I realized that I've been arrogant and heartless because I feel that some would step on me if I am too humble or too nice and I thought it was a good being mean. There's good being wicked. There's good being heartless because if you are not, I don't think I would survive in certain situation. But, being associated with these negative connotations, there are like pros and cons. You may lose someone, or you may lose your money. You may even lose your dignity if you make the wrong step! So, I think there's a degree of goodness in being bad. Afterall, being bad is a part of everybody. We cannot deny that. But now, I ought to be humble and helpful. I must be tolerant and give way sometimes. This is a habit already for me to say no here and there. I fear backstabbers and liars. So, I'm getting more cautious and be more self-conscious. I've learnt bits of my past and repeating it will bring no meaning into my life. So, we ought to be careful. But being careful does not mean being mean or harsh! The party's surprise is ready. Someone cursed my party! Someone said "Zul, I think your party is going to 'flop'. So I was like what you mean by flop? "Ouh. Flop is like not happening like that. Because not many people would come at that time." My answer is this, since when I force people to come at 4.30pm on the dot. Well, the surprise is going to start at 5pm and I said 4.30pm as a buffer time. Some would be late and some would be early. And doesn't mean everybody must come at 4.30pm! The party is until 11pm. You can come at 7pm or 8pm after 4.30pm for all you want. But what I want is that if possible, please come at 4.30pm because there's a surprise waiting for you people. Stop being negative. There's food, music and dance that's for sure. The rest is for me to know and for you to find out.